With bicycles, buses, ferries, planes, rideshares, sidewalks, subways, taxis, and trains at Angelenos’ disposal, why would any sane person choose car-dependency? Nobody Drives in LA celebrates sense and sensibility in transportation. 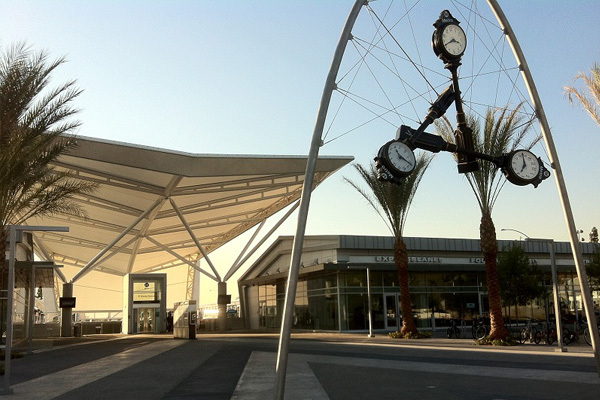 The Metro Silver Line opened on 13 December 2009, more than four years after the Orange Line, Metro’s only other Metro Transitway (or Metro Liner). Despite its silvery paint scheme, it feels more like a regular old bus than its bus rapid transit sibling. Unlike the Orange Line, there aren’t ticket vending machines at the Silver Line’s stops — one pays upon boarding the vehicle. Also, whereas the Orange Line runs entirely on a dedicated transitway, the Silver Line’s route includes a mix of dedicated transitways, HOV lanes, and even surface streets. It was a hot but breezy Election Day in Los Angeles that I chose to explore (after voting) along the El Monte Busway, starting at Union Station and ending at the recently-completed El Monte Station. I started by taking a bus downtown and there began the exploration from the Busway’s western terminus on Alameda just north of the 101 Freeway. Crossing over the 101 Freeway on the Broadway Bridge, I saw a reproduction of Ruben Soto‘s 1990 portrait of Mickey Rourke in a boxing stance. Titled I Know Who I Am, it along with a few other murals on the 101 were defaced with graffiti; Caltrans soon painted over the murals and ultimately replaced them with smaller reproductions printed on recycled plastic. The first reproduction was removed by thieves shortly before its planned unveiling; obviously a reprint has since been installed. To me it looks less like a mural than fleece throw blanket. 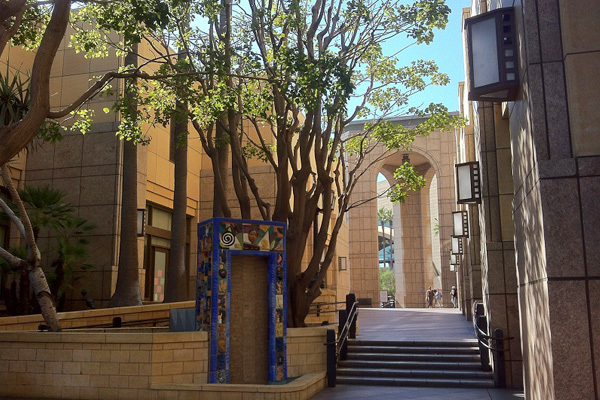 The area west of Union Station is decidedly on the beaten path; it’s one of the city’s most-visited tourist attractions. 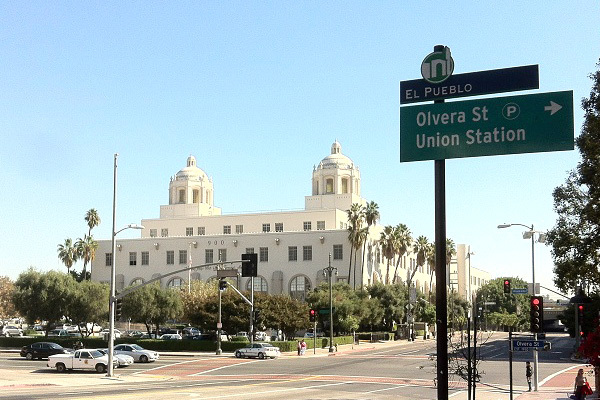 Immediately to the west is Olvera Street, where history and kitsch mingle on top of the Pueblo of Los Angeles‘s original site. Avila Adobe, built around 1818, is the oldest building still standing in the city, although it’s presumably had quite a few changes made to it since most 19th century homes didn’t include public restrooms, drinking fountains and museum displays. The beautiful, Italianate Pico House in the adjacent plaza was the first three story building in Los Angeles, originally built as a luxury hotel in 1870 for California’s last Mexican governor, Pío Pico. Next to it are the Merced Theater (1870) and Masonic Hall (1858). Across the street is the LA Plaza de Cultura y Artes, which opened in 2011. Next to that is La Iglesia de Nuestra Señora Reina de Los Angeles, a church completed in 1822. Situated just south of the plaza is the Old Plaza Firehouse, built in 1884. Due north of Union Station is one of the most off-the-beaten-path areas of downtown — an area occasionally shown on maps simply as the Civic Support. It’s home to the Twin Towers Correctional Facility, Men’s Central Jail, Los Angeles Superior Court, and — naturally — many bail bonds businesses. There are also several parking lots filled with city vehicles waiting to be repaired. Several of the street names: Bauchet, Naud, Rondout, Vignes, and others serve as reminders that this area was once the center of the city’s French population and the wine-making trade. I thought about grabbing food at Homegirl Café, but felt I should explore more before rewarding myself with a meal. A little further north is another under-explored neighborhood, known alternately as the North Industrial District, Naud (or Mission) Junction (after two former train stops), and Dogtown (not to be confused with Santa Monica‘s Ocean Park neighborhood, as featured in Dogtown and Z-Boys and Lords of Dogtown). There one can see the World War II-era William Mead Homes (also known as the Dogtown projects), LAX-C (an awe-inspiring Thai version of Costco or Sam’s Club), Farmlab, the California Drop Forge, and many other interesting spaces. I briefly popped into Los Angeles Terminal Annex; built in 1940, this building was formerly the city’s central mail processing facility. Following Google Maps‘ instructions, I attempted to walk through the parking lot of a certain private health foundation and was met by a security guard repeating “code five!” into his handheld transceiver as he ran toward me. He asked what I was doing and I replied, “I’m just exploring.” He responded with an exaggerated look of incredulity. I elaborated, “There’s a lot over there that I’m trying to get to — full of smashed up cop cars. It’s right over there,” I said, pointing directly at it. “No, it’s not,” he said with the condescending voice of authority that I assume comes with a walkie talkie and cheap suit. For the record, the parking lot I was trying to access was, in fact, 184 meters from the sight of this silly confrontation, and would’ve easily been accessed had he allowed me to pass through his parking lot. It would prove not to be my last run-in with The Man on this day. While downtown, sharing streets with bikes and cars and stopping frequently, the Silver Line feels much like any other Metro bus. When it takes off on the dedicated busway, it transforms into a super bus. However, the comparatively bumpy ride and that funky flute loop coming from the Transit TV speaker remind you that you are, indeed, on a bus. Even though the Silver Line stops at every stop — like a train — passengers tend to instinctively push the “stop requested” buttons, underscoring this fact. As we headed east, the bus passed C. Erwin Piper Technical Center (or PiperTech), a large brown building where all manner of city vehicles are brought in for repair. It’s also where city records are stored. 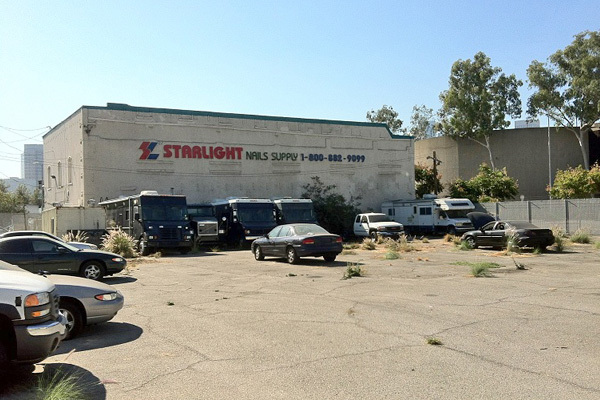 As we passed over the Los Angeles River into the Eastside, we were surrounded by a large, vacant, industrial lot. To the north I spied a billboard advertising Caine’s Aracade. 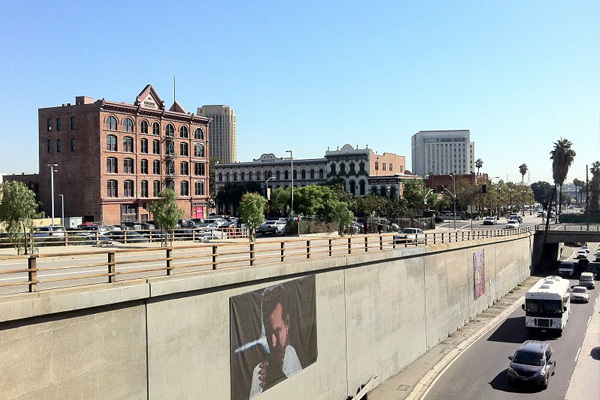 The LAC+USC Station is located in the northwest portion of Boyle Heights. 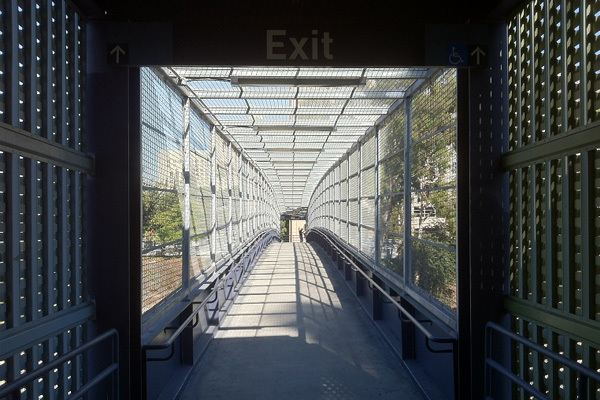 The pedestrian bridge leads north over the busway and train tracks. The most obvious landmark one sees upon leaving the station is the humongous Los Angeles County + USC Medical Center that the station is named after. 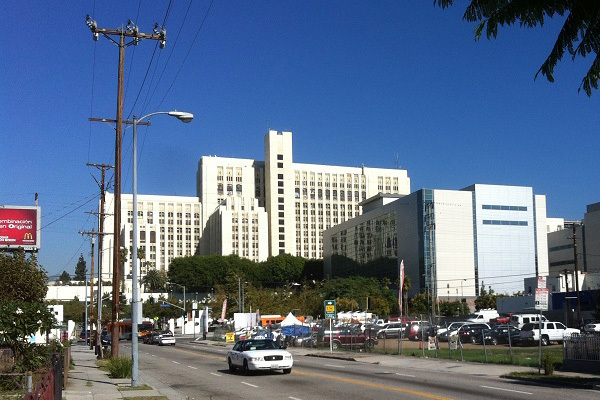 Marilyn Monroe was born there, at the county hospital, Stan Getz was processed in its jail ward, and it’s been featured in numerous films and TV shows, perhaps most recognizably in the exteriors for the ABC soap opera, General Hospital. I considered getting lunch in the county hospital’s cafeteria (assuming there is one), but instead opted to eat elevenses at Camelia’s, a small Mexican restaurant on State Street. All of the lights were off, I presume so that it wouldn’t be any hotter than it already was. A fellow diner chuckled as she watched Nunca te Olvidaré on the television above my table. After I finished my hearty meal I realized that the restaurant’s credit card machine was temporarily down and I had brought no cash. The owner was trusting enough to write down my total on the back of a business card and told me to pay another time (which I have). On Bridge Street, a Seventh Day Adventist church built in 1932 caught my eye. Along the way I passed by a yard sale where three women chatted in the shade. I thought about heading over to Provision Park, but a Día de los Muertos shrine on the other side of the street caught my eye. As I backed away to take a picture I realized that it was located within a community garden so I let myself in. Inside I met Leo, a volunteer sign painter who was watering the plants. He told me about Proyecto Jardín, a unique community garden and art and cultural space created in 1999 and is administrated by Irene Peña. 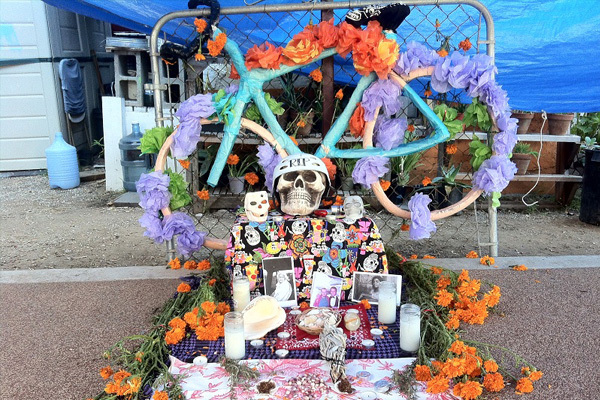 In back there were many shrines — including one with a “Yes on Prop 37” theme and another devoted to cyclists. Leo explained that the garden was affiliated with the Ovarian Psycos, an all-female Eastside bicycle crew. Upon disembarking from the Cal State LA station, I saw the Metrolink‘s San Bernardino Line train, which runs parallel to the Silver Line for much of the way, eventually taking passengers as far as the Inland Empire. 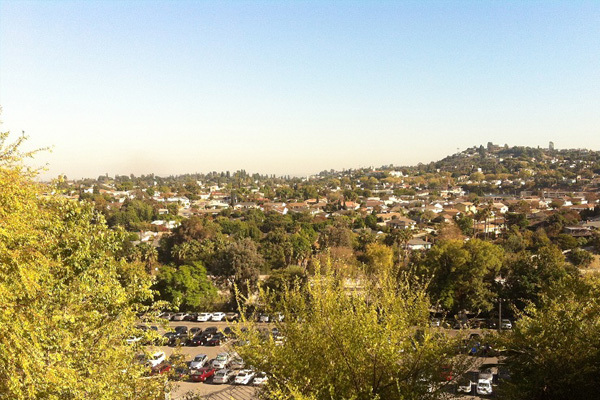 After climbing a flight of stairs, the pedestrian bridge heads north toward the campus in the University Hills section of El Sereno. Just west, the Campus Road bridge heads south to the City Terrace section of East Los Angeles. I have no doubt there are more attractions in that residential neighborhood than just St. Lucy’s Catholic Church, the library, a Burger King, and a Chevron, but I decided to continue north to explore the campus, partly because I wanted to stop by the sixteen-foot high bronze statue of Confucius (孔子), since it was the day on which his birthday is observed in Vietnam. As I circumnavigated Jesse Owens Track and Field, I was passed by a small group of runners. Continuing north up Circle Drive I passed a group of young women playing tennis and enjoyed the pleasing pop noise of the ball against racket. Continuing past a baseball game I eventually headed past the music building where the sound of pianos and singing mixed with the loud buzz coming from the construction site of the Angeles County High School for the Arts across the street. 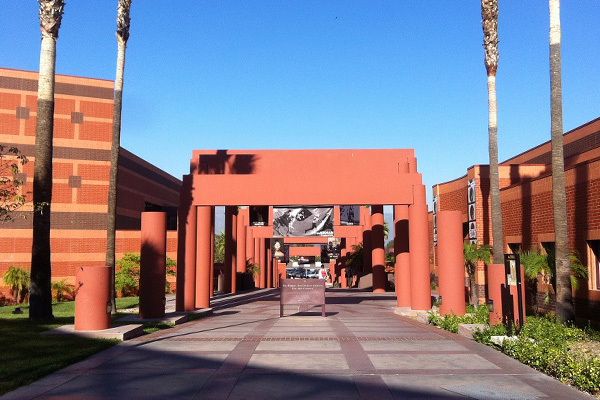 I next walked through the Luckman Fine Arts Complex. For 19 years the arts complex has brought art, dance, music, and theater from around the world to the Eastside — and it’s a 1.3 kilometer walk across campus from the Silver Line stop. 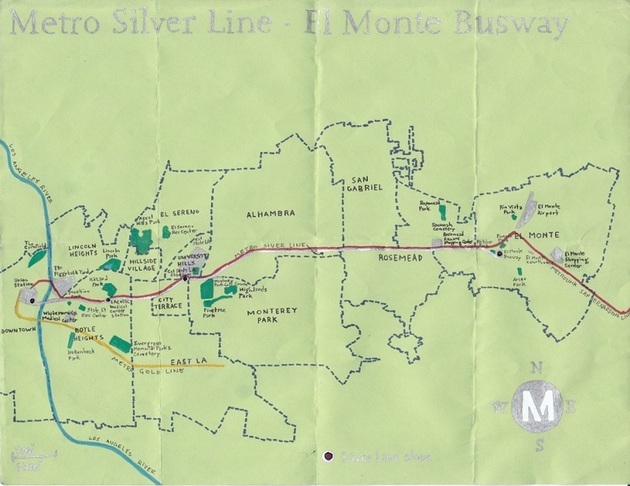 After its two stops in the Eastside, the Silver Line takes off across the San Gabriel Valley, not stopping until it reaches its final destination, thirteen kilometers east in El Monte. Above the freeway walls and through the occasional breaks, I could make out trees, power lines, the San Gabriel Mountains to the north, and the Puente Hills to the south. 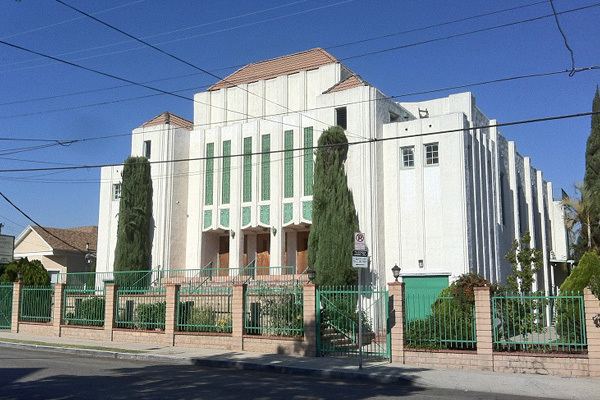 In San Gabriel I caught a glimpse of Saint Sava Serbian Orthodox Church. 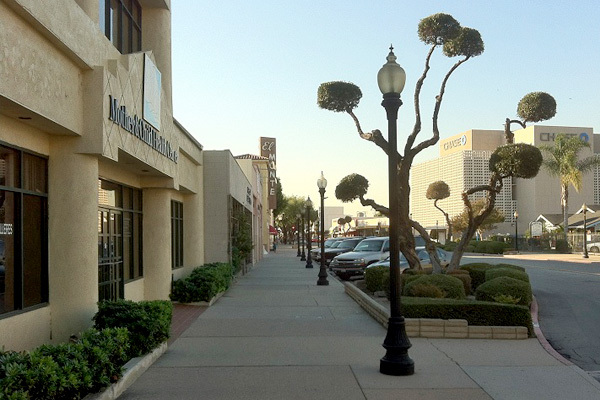 In Monterey Park I could see Atlantic Times Square, a large mall some have nicknamed “The Asian-Americana” — a nod to the Americana shopping complex in Glendale and Atlantic Square’s mostly Chinese and Taiwanese clientele. Otherwise there was little visible evidence that we were flying through the nation’s largest ethnically Chinese suburb, until we passed East West Bank, Cathay Bank and a cluster of other Chinese-American businesses right before crossing the Rio Hondo before arriving at the station. 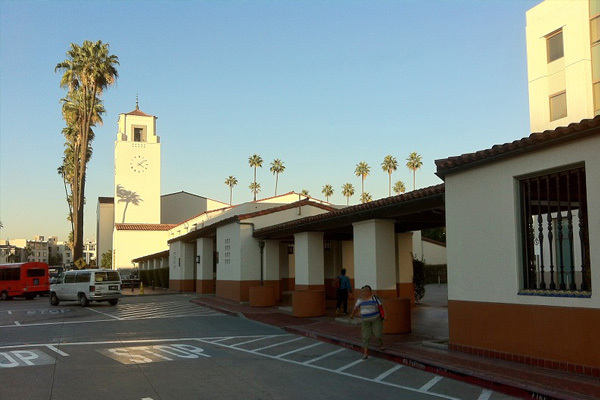 El Monte is an interesting town with a long history as a transportation hub. It was first settled due to its location between the Rio Hondo and San Gabriel rivers, which contributed to its soil’s fertility. “Monte” is archaic Spanish for “scrubland” or “woodland,” and reflects its past role as something of an oasis within the semi-arid valley. It later became a western terminus of the Santa Fe Trail, reaching all the way from the eastern terminus in Kansas City, Missouri. A Southern Pacific Railroad depot was built there in 1873. The El Monte Airport, built in 1936, is the last remaining one in the San Gabriel Valley; Alhambra, Arcadia, Monrovia, Rosemead, and San Gabriel‘s airports have long since closed. The old El Monte Bus Station opened in 1973. The new one opened to the public on 14 October 2012. There were many Metro officials present at the new station to help facilitate people’s travels, but I had a comically frustrating time trying to leave the station. There are small exit signs here and there, but they seemed to inevitably lead to routes marked with “No Pedestrian” signs. After what seemed like an eternity, I found what resembled to me a standard issue sidewalk with no apparent prohibitions to its usage as such. As I walked along it a startling voice boomed, “Sir, you have to turn around!” I stopped and looked around, not sure if I was the one being addressed — and saw only a bored-looking Metro employee staring blankly in another from a behind a window. I then continued on and the directive was repeated. This time I realized it was coming from a police car’s PA system. I asked the unseen officer how to get out of the station, and he told me to “go back down and then come back up the middle.” Confused, I went back down stairs. A man leading a tour used my blunder as an example of how quick they are at the station to act on anything they consider to be “shady” (like a pedestrian on a sidewalk, apparently). I ultimately enlisted the services of a Metro employee named Mike and explained to him my difficulty in escaping the station. He reasoned that most people in the station are headed elsewhere and not just aimlessly exploring the station’s surroundings. We went back upstairs and he pointed the way out — only it was the way that I’d just attempted. He then showed me the main entrance and exit and surmised that every effort was being made to streamline the process, and that by walking down that sidewalk I’d apparently upset the whole system. Even if most people at the bus station were catching a ride to somewhere else, it was my intention to explore, so I headed east down Ramona toward El Monte’s Civic Center. 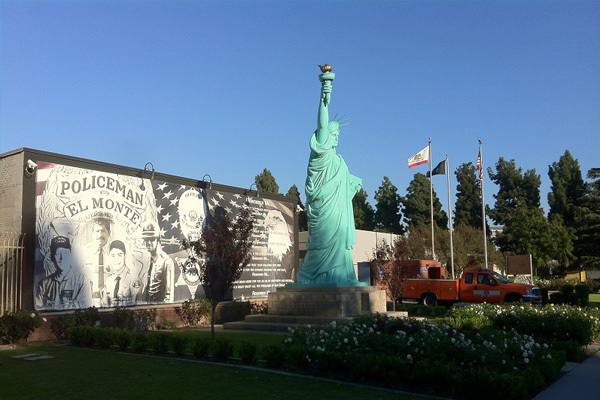 Across the street is a nine-meter-tall fiberglass replica of the Statue of Liberty, donated to the city by Dr. Jung T. Wang, Paul Mu, and Victor Chiang on 4 July 1986. Earlier this year, sixty rose bushes, Japanese boxwood shrubs, and two purple leaf plumb trees were planted in front of it in commemoration of the city’s 100th anniversary of incorporation. A visit to the representation of Libertas, the Roman goddess of freedom, seemed an appropriate stop on this civic holiday. I walked northwest along Valley through El Monte’s sleepy downtown. A group of uniformed school kids walking behind me quizzed one other on their Cantonese and Spanish abilities as they passed a basketball amongst themselves. Chico Che y la Crisis‘ song, “La Botellita,” played from an unseen speaker. Further along, a Tejano song blared from within Musica Latina. Overhead, a noisy pandemonium of Mitred Parakeets and a steady stream of small engine airplanes occasionally interrupted the relative calm. As shadows grew long and the air turned golden, I determined to head back downtown. With considerably more ease than my exit, I re-entered the bus station and hopped back on the Silver Line. Although cars heading west on the 10 moved at a healthy clip, eastbound traffic was mired in gridlock. I timed the trip from one end to the other — sixteen minutes. Back at Union Station I relaxed at Traxx, the Union Station bar, enjoying a beer and watching early election results as the sun set.